Gul conveyed his thoughts on bilateral relations, the solution of the Cyprus issue, possible participation of Turkey in a Free Trade Agreement between the US and the EU, counter-terrorism, Syria, Iraq and the Middle East peace process toKerry. John Kerry, in his part, underlined that there could be no other ally and partner closer than Turkey to the US in the solution of the problems. Kerry informed PresidentGul that US President Barack Obama was determined to very closely work with Turkey. Turkish Foreign Minister Ahmet Davutoglu, Undersecretary of the Turkish Foreign Ministry Feridun Sinirlioglu, Turkish Ambassador in Washington Namik Tan, and US Ambassador in Ankara Francis Ricciardone also attended Gul's meeting with Kerry. Turkish Presidency sources said that President Gul presented a photograph taken on February 22, 2008 showing the then US senators, current US Vice-President Joe Biden, the new US Secretary of Defense Chuck Hagel and Kerry to John Kerry on Friday. President Gul said that his meeting with Kerry took place in the same room but that the room went through restoration since 2008. 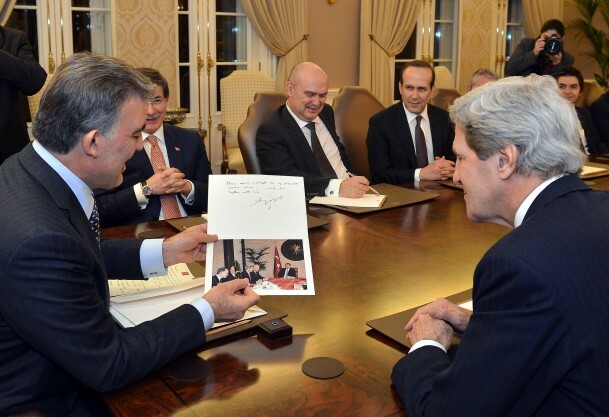 Kerry then asked PresidentGul if he could write a few words on the photograph such as "the most important three men". President Gul wrote on the photograph "the most important three men of the Obama administration with me", signed it and presented it to Kerry. Kerry told PresidentGul that he remembered the day the photograph was taken.